Nicholas Hariades was born in London and studied amongst others with Michael Chance, Peter Harrison, Claudia Eder and Rita Loving. In 1996 he made his professional debut in Germany at the Hessisches Staatstheater Wiesbaden as Mago Christiano in Handel’s Rinaldo. Since then he has regularly appeared as a guest artist on many of Europe’s most important stages. In Wiesbaden he sang in Maurizio Kagel’s Aus Deutschland and in Ingomar Grünauer’s Winterreise. Further engagements in Germany led him to the Herrnsheimer Schlossfestspiele in Worms (Orpheus in Gluck’s Orpheus ed Euridice and to the Stadttheater Hildesheim (Ruggiero in Handel’s Alcina). At the Opernhaus Zürich (Switzerland) he sang Ernesto in Haydn’s Il Mondo della Luna, and repeated this part at the renowned Haydn Festival Eisenstadt (Austria) the following season. Nicholas Hariades also covered roles at the Royal Opera House Covent Garden, among others Nireno in Handel’s Giulio Cesare and Go Go in Ligeti’s Le Grand Macabre, a role which he portrayed to acclaim at the Tiroler Landestheater Innsbruck and the Komische Oper Berlin. At the Tiroler Landestheater he also sang Arsace in Handel’s Partenope, and he appeared as a guest artist at the Opernhaus Halle as Gandarte in Handel’s Poro. For Glyndebourne Touring Opera he covered the role of Little James in Harrison Birtwistle’s The Last Supper, and he sang in the German premiere of Das Märchen der 672. Nacht by the German composer Jan Müller-Wieland at the Stadttheater Nordhausen. 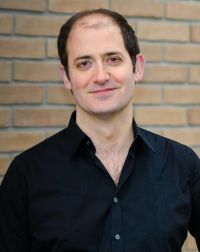 He has also performed Ottone in Monteverdi’s L’incoronazione di Poppea with the Munich ensemble Cosi Facciamo and two world premieres: Orfeus by Volker Nickel in Munich, and Strom – Die Oper in Vienna, where he created the role of Dionysos, which was especially written for him by the Austrian composer Johanna Doderer. In 2007 he performed Puck in Purcell’s The Fairy Queen at the Vorarlberger Landestheater and once again the role of Go Go in Le Grand Macabre at the Bremen Theatre in Germany. In 2008 he performed in another world premiere, this time, the opera Kleist by Rainer Rubbert at the Brandenbuger Theater. In 2009 he made his debut as Oberon in Britten’s A Midsummer Night’s Dream at the Volksoper Wien and in 2010 in Feiningers Fugen (Musik von Bach, John Adams und Glenn Gould) at the Stadtheater Gießen. The following year he performed the title role in Mozart’s Ascanio in Alba at the Opernbühne Bad Aibling, and in 2012 he appeared once more in the Stadttheater Giessen in Bach's Matthäus-Passion. In 2013 he sang in the Carl Orff Saal, Munich in Oprheus - Variationen über Liebe und Tod with Das Andere Opernensemble. In addition to his opera career, Nicholas Hariades has also enjoyed successes at some of the most prestigious concert halls of Europe. He sang at the Alte Oper Frankfurt, in Winchester Cathedral and in the Musikhalle Hamburg. He has also performed at many renowned baroque music festivals including the Utrecht Early Music Festival with Frieder Bernius and the Stuttgart Chamber Choir at the Muziekcentrum Vredenburg. His concert repertoire encompasses music of the baroque era (Handel’s Messiah, Saul, Jephtha, etc. – Bach’s Johannes- and Matthäus-Passion, the B minor Mass, etc.) as well as modern repertoire (Carl Orff’s Carmina Burana). In the Wiener Konzerthaus he had a resounding success in the role of Walter in Vatermord, an opera by the Chinese-Austrian composer Shih. Highlights in 2016 are the Angel in Jonathan Dove’s church opera Tobias and the Angel with the Bavarian Radio Orchestra and Ulf Schirmer (radio broadcast for BR-Klassik), Handel’s Brockes-Passion with the Choir of King’s College Cambridge (radio broadcast for BBC R3), Bach’s Johannes-Passion on Good Friday in Munich’s Herkulessaal and a staged production of Handel’s Belshazzar with the Arcis Vokalisten in Munich. "Nicholas Hariades überzeugte als in allen Lagen bruchloser, ausgeglichener Altus."